This is one of my favourite books Karen. I was mummy to Lauder then Shane – two lovely rough collies like Sam. I agree dogs (and cats) are wonderful companions. They leave a huge gap when they leave us. Thank you for this lovely review. Sally does indeed write beautifully! Thanks for sharing your thoughts on this, I haven’t read the book but hope to. I must pass the word on to my teacher friends. I also loved this book, Karen. A splendid review. 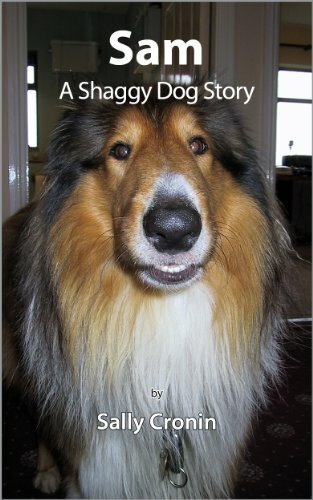 What a wonderful review that would have Sam doing cartwheels for his memoir Sam, A Shaggy Dog Story.. He would have been around to Karen Dowdall’s in a flash as he can tell a dog lover anywhere, especially one who appreciates his passions in live… cheese and sausages… love it. Karen, thank you for this lovely and compelling review! When I was growing up, we had a beautiful collie. I am 77, and I was likely 9 – 10 then. That was an immensely popular pet then, along with poodles (standard size), cocker spaniels, scotties, doberman pinschers and boxers, to name a few I can think of. It was a different world then and it is interesting how beloved pet types have changed now. This appears to be a fantastic story for all of us dog lovers. We have six senior chihuahuas, all of them with physical challenges, or who suffered abuse before we rescued them, often from being dumped out into the streets. We have one who is deaf and going blind, and who has a collapsing trachea, but he is doing great now. They all sleep with us and eat with us and all are healthy and happy. So yes, I appreciate this very much and wish much success to Sally. Thank you kindly. How could anyone resist that shaggy dog face?? Yes…I know. I totally fell in love with Sam and his story. The writer is author Sally Cronin. She is a fantastic writer, author, commentator, and is an expert in many areas, especially for woman’s health issues. Yes…she is such a great writer. wonderful!